The Gay Gamer: Super Maui-o Bros. I don't know what the weather is like in your neck of the woods, but here in Seattle it's cloudy and cool and summer seems to be at least a month (if not more) away. As such, I'm finding myself attracted to anything and everything that makes me think of the sun and warmth these days--which may explain my excited reaction upon seeing the t-shirt design below this morning. 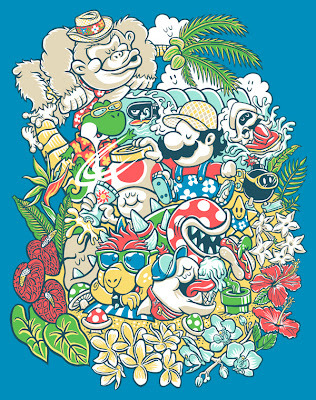 Besides the setting, my favorite aspects of the design above--called "Super Maui-O!" 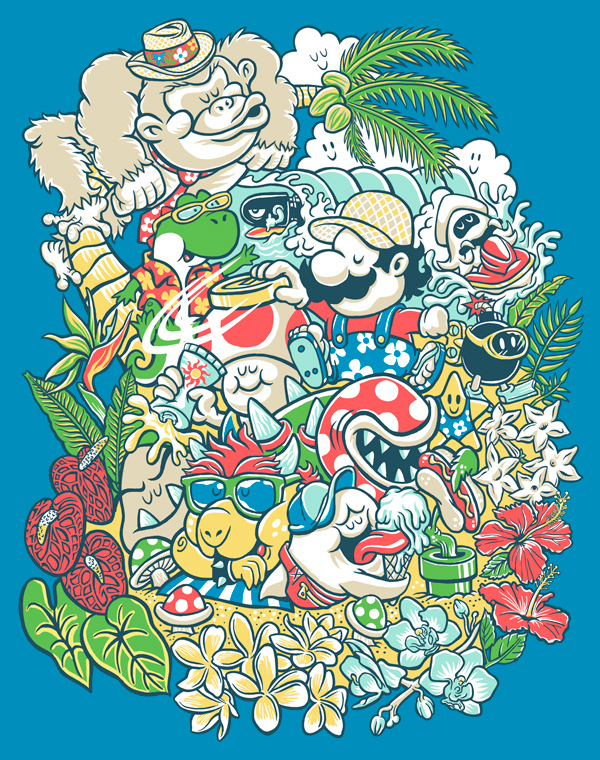 and created by Flickr user Lucky1988--are the Blooper riding the Ski-Doo in the upper-right corner, the surfing Bullet Bill to the left of the flip-flop-sporting Mario and the Toad squeezing sunscreen on the toothy Goomba in the center of the illustration. If you'd like to own a t-shirt bearing this design, vote on it in the next seven days at threadless.com. I love the Boo putting that tongue to good use on an ice cream cone! BTW, apricotsushi -- love the new pic! Oh, I won't be drawing it myself, Anne! I'm planning to hire someone :) I can doodle well enough, but I definitely wouldn't want to come up with my own avatar or header.